Professor Kelly, a regional expert from the Political Science and Diplomacy Department of Pusan National University in South Korea, was discussing the news about the country’s president being impeached. Although the door to Professor Kelly’s home-office was shut, his young daughter danced in while her father was attempting to answer questions. Professor Kelly attempted to push his daughter away mid-conversation, but was then joined by a baby wheeling itself around in a stroller, closely followed by their stressed-out mother who moved the two out of the room as quickly as she could. The interview continued uninterrupted. Unsurprisingly, after the footage was shared on Twitter by the BBC, praising Professor Kelly for keeping his composure, the clip has gone viral. 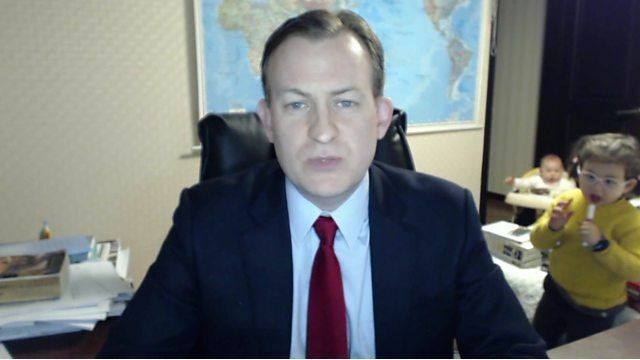 We spend a great deal of time advising clients on how to handle live TV interviews and now have a new piece of advice to add to our guidelines: If working from home, make sure your office door is locked and you can’t be interrupted by children or animals.